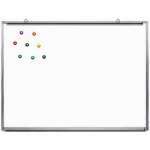 Buy Whiteboards, Dry Erase Boards: See Our Best Sellers! The modern classroom or boardroom requires an updated whiteboard. Unlike old-fashioned chalkboards, dry erase boards don&apos;t make chalk dust, and are much easier to write on. They come in a number of different sizes and styles so you can fit one in virtually any space. Where should you put a whiteboard? White board placement depends on what kind you are using. Hertz Furniture has classic white boards as well as double-sided, portable and interactive whiteboards. Many of our dry erase boards come with extended warranties for years of demonstrations and explanations in an educational or professional environment. Which rooms should I put a whiteboard in? Whiteboards are useful in virtually any setting. They are helpful for keeping track of a meeting agenda in the boardroom, planning out a strategy in the locker room, or demonstrating your methods in the classroom. Their highly-visible surfaces can be used with colorful dry erase markers for clear explanations and categorizations. Markerboard placement should definitely be a consideration when determining boardroom and classroom layouts. Which subjects do I need a whiteboard for? No matter what subjects are being taught, a markerboard is an incredibly useful classroom tool. Math problems can be written out and solved in no time, without the distraction of squeaky chalk. Chemistry diagrams can be color-coded by chemical, and history outlines can be easily organized. If you need to define new vocabulary terms in English or a foreign language, you can easily switch-off between colors for the purpose of differentiation and clarity. Using a selection of board markers is a great way to increase classroom colors and help students stay engaged during a lesson. Many of our whiteboards have extra features that make them even more convenient. Magnetic whiteboards enable you to hang papers without causing damage as a result of sticky tape. You can hang up important fliers or sign-up sheets in a prominent position at the front of the room, and take them down easily when they are no longer relevant. Built-in marker trays are another useful feature to have. They provide an accessible place for markers so they are readily available whenever teachers need them. How can I use the whiteboard to help students with Dyslexia? A whiteboard can be a very important tool for helping students with disabilities, in particular students with Dyslexia. While the dyslexia debate has not yet reached definite conclusions, one thing is for sure: helping students stay organized and presenting information in a clear way is definitely helpful. Small efforts such as writing the schedule on the board, using different colors for each line of information and making sure that writing is well spaced can make a big difference to all students, and those with Dyslexia in particular. A dry erase board is particularly conducive to these strategies because writing with whiteboard markers tends to be big and many marker colors are available. For the latest in digital board technology, try an interactive whiteboard. This is an excellent option that can connect to a computer or data projector for interactive presentations, making it easy to bring technology into the classroom. An interactive white board is controlled by a special multimedia pen so the presenter or teacher can stay in the front of the room rather than having to remain by the computer. With the interactive board, you can save lessons and notes so you don&apos;t have to rewrite everything when you want to do a quick review. What kind of whiteboard is appropriate for the conference room? If you are concerned that a plain whiteboard does not have the elegant professional feel that you need in the workplace, we offer lots of whiteboard cabinets for office settings. Our dry erase board cabinets have sleek wood veneer doors which can be coordinated to the finish of your other office furniture. The doors can remain closed until you need the contents for a presentation, when you can simply open the doors and have an instant whiteboard. Should I get a reversible whiteboard? For maximum flexibility, we also offer double-sided whiteboards. Reversible whiteboards give you double the amount of writing space without taking up any extra space in the room. When you have filled up one side, you can simply flip the white board over and have a clean writing surface. If you want to go back to an example that was illustrated earlier, you can simply flip the dry erase board back over to the first side. What kind of board should I get for the music room? 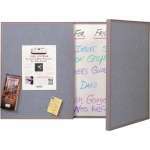 Specialized music boards are great for a band room, music room or any practice space. They feature permanent lines which remain in place even when the music whiteboard is repeatedly erased. 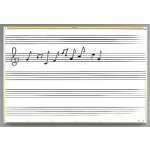 With straight lines right there, it is easy for the band leader to write the notes for a certain part of the score that they would like young musicians to focus on. Hertz Furniture has a great selection of whiteboards which are convenient to have in your office or school. All of our models come from reliable manufacturers including Aarco and BestRite. Whether you just need to replace an outdated chalkboard or two, furnish a boardroom or supply an entire high school, you have come to the right destination for top-quality dry erase boards.